Hi! I am Kecia… from Kecia’s Flavor Breakthough! And like it says, it is ALL about flavor! 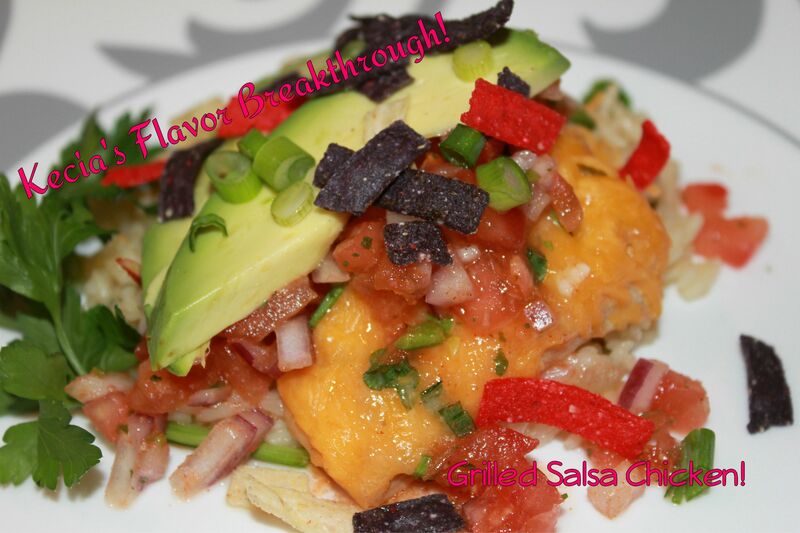 I love to cook and create my own recipes that I share on my blog! I try my best to use minimally processed ingredients and make everything from scratch. I am not a baker, but am trying so you will see a lot of other blogger’s recipes when I do bake incorporated in the recipes! Recently I have started a new feature called, “Day Trip Adventures” where I travel within my area, near Rochester NY and stop at various local wineries, shops and farmers market as well as take some fun photos of the local scenery. So, whether you are from the area or not you will be able to see what it is all about… I am hoping to create a new recipe or two using the ingredients I find along the way. This recipe is simple and based on Monterey style chicken, loosely. It is cheesy, spicy and full of yummy fresh ingredients! And tonight I need something a little quick! I will serve it with some of the salad and I think Jalapeno Rice, then out the door! Hope you all are hungry! This can be grilled or done in an oven proof skillet. Pour olive oil in ovenproof skillet and heat over medium high heat. Add chicken and sear on both sides. Combine, vegetable broth, wine, cumin chili powder, garlic cilantro and salt and pepper in a bowl. Pour over chicken and cover. Place in oven and bake for 15 minutes or until chicken reaches 165*F.
Remove from oven and place on foil lined cookie sheet, cover with the cheese and some of the chopped scallions (leave some for garnish). Place back in oven for 5 minutes or until cheese is melty. Remove from oven, spoon some salsa over the top, lay two slices of avocado on top, sprinkle with some more scallions and tortilla strips and serve hot. Rinse and pat dry the chicken, lay in a shallow dish. In another container mix together lime juice, wine, vegetable broth, olive oil, cumin, chili powder, garlic, cilantro, all but 2 tablespoons of scallions and salt and pepper. Pour over chicken and set in fridge for 30 minute or so to let the chicken marinate. Place chicken on grill, cook on first side for 6 minutes, flip, repeat, flip, go an additional 2 minutes, flip and check temperature. It should be 165*F in the middle of the thickest portion. Top with cheese and close grill for a couple more minutes. Pull off of grill. Plate and top with a little salsa, scallions, 2 avocado slices and tortilla strips. Serve hot with a side of Jalapeno Rice, Avocado Corn Salad or a regular salad. Come on by sometime! And remember; if it is as good on the plate as it is in my head recipes will post soon! This looks incredible! What a great summer dish – love it! Deilish! This is my kind of recipe! Yummy! Awesome post and recipe, Kecia! 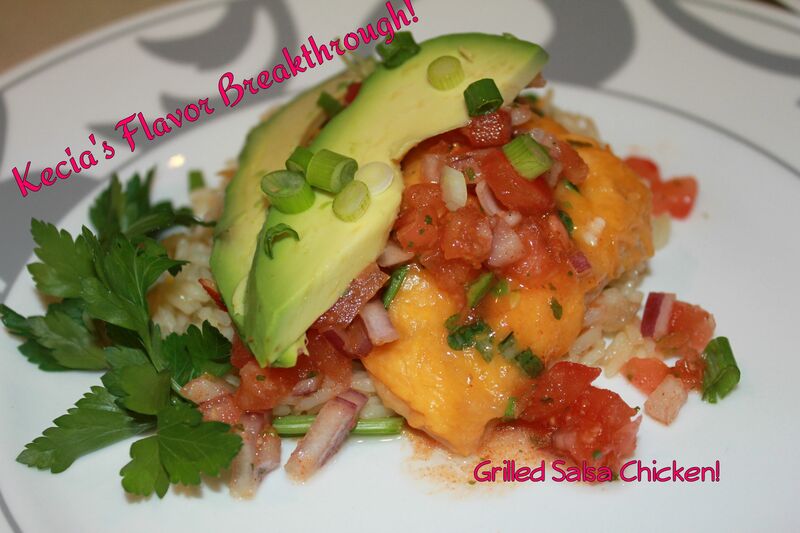 I love spicy chicken and anything with avocado in it is a winner for me! Mmmm I love chicken and avocados! You got my attention with this fantastic idea!!! G’day! This looks delish! Always a pleasure to visit here and read the great posts and recipes!